On the heels of their problems in Connecticut, Best Buy is now facing another scandal that could cost them tens of millions of dollars, and more importantly, further damage their credibility in the eyes of the consumer. The problem stems from a lawsuit, filed in 2003, which accused Best Buy of signing up at least 100,000 customers for trial subscriptions to Microsoft Corp.’s MSN Internet service from 1999 to 2003, in many cases without their knowledge. Once the trial period ended, the customers began incurring credit card charges they had not approved. Today, it was reported that a lawyer for Best Buy Co. has acknowledged that he falsified e-mails and a memo before turning them over to plaintiffs in the nationwide class-action lawsuit. Trust is a key ingredient in Loyalty. If you act against the best interest of your customer for you own internal gain, you run the risk of losing both. Earlier this week, I wrote about the opportunities in addressing the sources of customer dissatisfaction. On Friday, APs Technology Writer, May Wong, published a report citing difference in the service levels between Circuit City and Best Buy. The report was insightful and absolutely reinforced the points I was making earlier in the week. I’m including some quotes and commentary below. This customer’s past experiences have let him to solid opinions of the two retailers. Who do you think he recommends to his friends and family? For sure, bargains and good rebates could be found at the stores of either chain — an important draw for the price-conscious American public. But other times, it’s as basic as how a store feels, how the products and aisles are laid out, how the workers there treat you. A friendly greeter is stationed just inside Best Buy’s front door. “How’s it going? Welcome to Best Buy,” he repeats. Within a minute of browsing in a section, a Best Buy associate swings by to offer assistance. The staffer casually dispenses product info or comparisons, and just as quickly lays back if you decline the help. A visit to Palo Alto’s Best Buy and Circuit City to pick up a component-video cable illustrates the differences. At the Circuit City, it took some effort to find a store employee to ask where to find the cables — and the red-shirted employee who was tracked down misdirected this shopper to cables for TVs. At Best Buy, the greeter at the door quickly responded with a more specific question, “What kind of component video?” By asking, he learned the cable’s purpose was for a game console and pointed to the video game section. The desired Sony-branded cables were sold out, but the Best Buy associate did double check the store inventory. That kind of attention to detail goes a long way in a shopper’s experience. At another Best Buy in Sunnyvale, for instance, the music MP3 players on display were in good working order, and a patron could test the controls and use headphones to listen to them. By contrast, the Palo Alto Circuit City’s portable players — with the exception of a separate display for Microsoft Corp.’s Zune player — were not powered and lacked headphones so a shopper couldn’t get a good test run of the devices. Product information placards were also missing from some models. The bad news for Circuit City is that this “little stuff” is rampant throughout its stores and it all adds up to a pretty crappy experience for customers. Both companies recently reported results for the previous year and the differences were like night and day. I am not an analyst and I can’t tell you to what degree Circuit City’s continued lagging performance is attributable to the sources of dissatisfaction in their stores, but my gut tells me that it is a significant cause. The good news is that these problems can be overcome and for the most part, the solution doesn’t involve a big capital investment. What it does require is much more valuable, and perhaps more scarce, than money. It requires people that care. Store associates that take the time to look for things that aren’t right with their store and fix them. Support associates that are not only responsive to the needs of the people in the store, but are proactively looking for ways to improve the operation so that the store associates can focus on the customer and not the infrastucture. Remove the Sources of Dissatisfaction. That’s the fourth item in my Prescription for Building Loyalty but after Listening to your Customers, it’s the next most important thing that retailers must do. I have several official and unofficial jobs at Circuit City. One of the “official” ones is that I am heading up our entry into the virtual world of SecondLife. Partnering with IBM, we have a “demonstration store” on one of IBM’s islands. It’ was in no way designed to be a compelling SecondLife experience, but was intended to be an interesting device to show the “art of the possible” to our executives. The “store” has been up for a little over 3 months and we are starting the process of envisioning the second generation experience. Our IBM partners told us that our competitors from Minneapolis were inquiring about SecondLife at January’s CES. 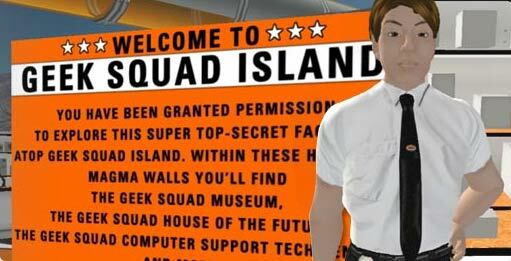 Today, I saw that Geeksquad island has opened in SecondLife. That’s a fast implementation and points out the strength of BestBuy’s Sense & Respond capability, but the big story here is something else entirely. Looking at the Geek Squad SecondLife announcement page, I came to a realization about the different marketing approaches for Geek Squad and firedog. For months, I’ve been trying to figure out why I didn’t feel comfortable with the firedog brand. Today it hit me. 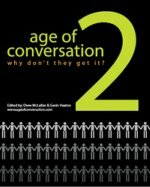 Sure, most Geeks have probably never even been to SecondLife, but the story that has been build around the “Geek” makes it easily believable. It makes sense that “geeks” would be out on the technology edge. Contrast that with firedog which uses the metaphor of man’s best friend to represent the brand. The big word here is “Loyal”, but there are a whole series of other words that are used to describe what “what makes a firedog a “firedog” including “Tidy”, “Real”, “Grounded”, and “Fresh”. The problem is that these are just words. They don’t really tell a story. They don’t say “these guys live for the technology problems that drive you crazy”. There is no “mystique”, no story about who these guys are and why you should use them. It’s simply not as engaging as the “Geek Mystique”. I’ll probably get some serious grief from my Circuit City family for this post, but I have to call it as I see it. In the interest of providing equal time, and to point out that other CE retailers struggle with delivering a great customer experience, I offer another customer video. While the filmaker’s work is not as impactful as the Circuit City example, you get to ride along and have the experience first-hand. In the end, the same point is made: Customers are rising up and telling their stories and companies should be listening. This video, which was made a year ago, has been viewed over 3300 times on Google Video. Best Buy, the nation’s biggest consumer electronics retailer, Best Buy has a big problem. They appear to have been caught with their hands in the cookie jar. Like many retailers (including my employer, Circuit City), BestBuy provides access to their website from within their physical stores. The problem is that the prices shown in-store are higher than the prices shown on their website when accessed from outside the store. The vast majority of CE customers research their purchased on the web before buying. They often decide on what and where to buy based on features and price, and then go to the selected store for a final look and to complete the transaction. For many Best Buy customers, the price went up when they walked in the door. In some cases, they may not have even realized it. Now, at least one state government is conducting investigations and you can count on more to follow. I expect proposals for a Class Action suit have already been put together by some eager legal team. Loyalty is a customer’s response to advocacy and earned trust. It doesn’t matter whether BestBuy’s “problem” is the result of planned deception or simply a bad design, the appearance of impropriety is going to cost them some of that trust and loyalty. Has your organization reviewed its customer touchpoints to ensure that you don’t have systems or procedures that could damage the trust your customers have in you? I get paper based junk. My reward for spending around $10,000.00 since joining the program…..and the most recent offer following the holiday season? Man do I feel special. This is a campaign, nothing more. Marketing 1.0 just like the airlines. Monetize your list, not build better relationships with your “special” customers. Chris is not alone in his feelings if the comments are any indication. Companies spend lots of money on loyalty programs. Often the approach is credit card based, primarily because the business model is a little more sellable to the CFO, but in the end, credit-based rewards only benefit the credit card company. Plans that offer incentives and perks don’t fare much better as they simply attempt to “buy” your customer’s loyalty. Understand what your customers want. This requires you to actually talk with them and listen! Engage them in an ongoing conversation. Provide products and services that support the things they are passionate about. People’s passions drive where their disposable income gets spent. If you can tap into that, you become a destination. Help them to get the most out of the products and services you offer, both before and after the sale. Consistenly deliver great experiences that exceed expectations. Start by eliminating sources of dissatisfaction. Then act as an advocate for your customer at every touchpoint. Advocacy is the key. You can’t buy loyal customers, but you can be their advocate and advocacy is contagious. A customer who is loyal to your brand because they see you as their advocate, will return the favor by advocating for you. That’s how you build loyalty! Best Buy is going to sell a packaged solution of Media Center plus home automation. Literally, it’s a package — a box. A customer walks into a Best Buy store, delights in the demo, buys the package, and waits for its arrival in a big box about four-foot cubed. The package costs $15,000. For that you get a Media Center PC, Lifeware automation software from Exceptional Innovation, an Xbox 360, IP surveillance cameras, automated light switches, a thermostat and installation. It’s a complicated business model, called ConnectedLife.Home, and it’s bound to pit the new group against other Best Buy factions like Geek Squad. Click here to read the very long and detailed article on this new innovation.